We may be located in Waterloo, but our neighbouring city of Kitchener, formerly known as Berlin, is home to many of our clients. German heritage is strong in the Region of Waterloo and many of our clients appreciate and respect the quality of German engineering. 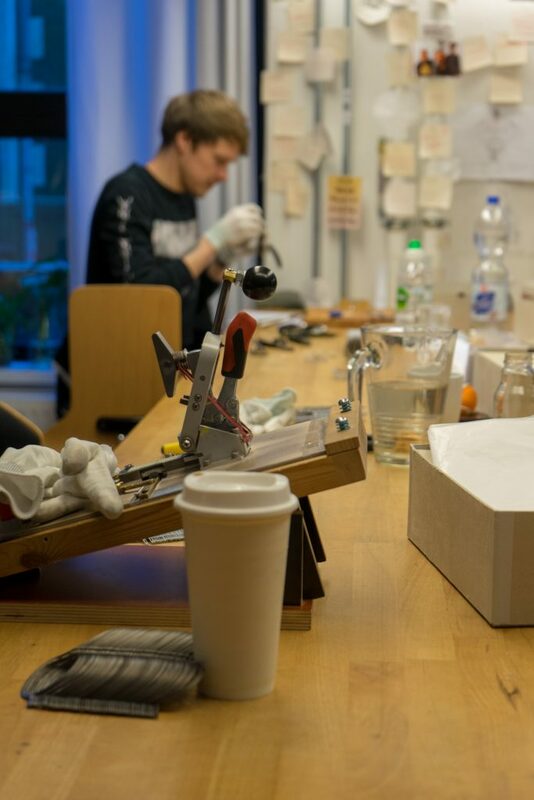 We decided to travel to Berlin so that we could visit the Mykita Haus and deepen our understanding of this independent eyewear powerhouse. 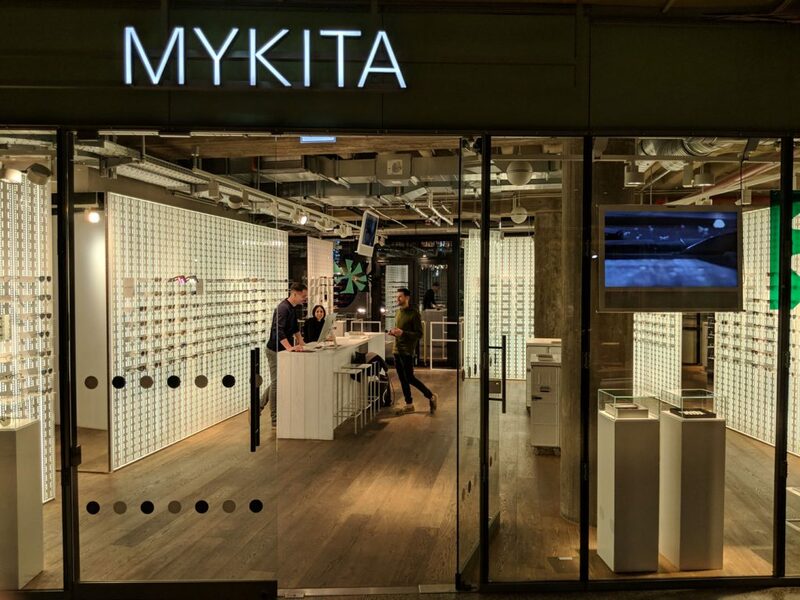 Many emerging eyewear designers look to Mykita as a leader in the industry. Mykita has been recognized internationally, not only for their advanced technical designs but also for their impact on the fashion world. Our tour of the Mykita Haus began with us scratching the ears of one of the many dogs that are allowed to come to work with the employees. 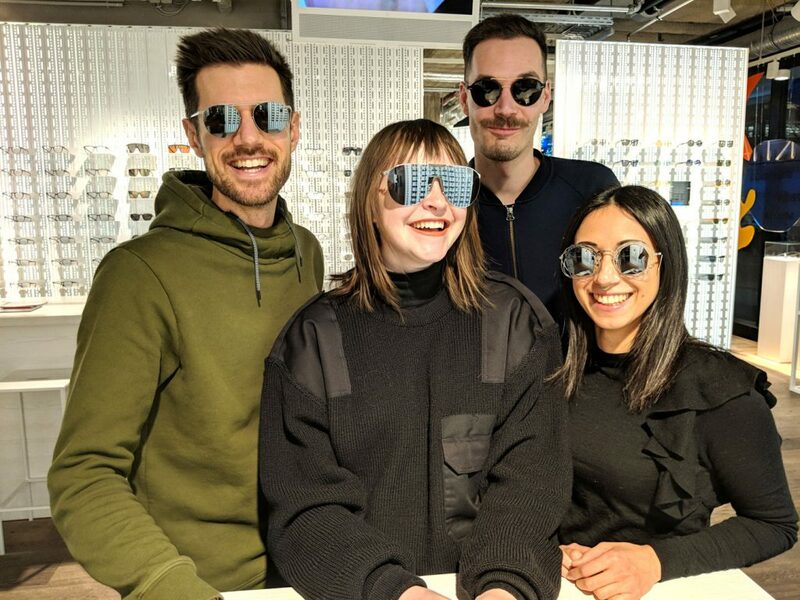 Mykita began as a much smaller group of like-minded individuals and, even though they have grown to over 300 employees, they still maintain a family-style working environment. The entire team is broken up into smaller units (quality control, production, design, communications) and each unit has their own sub-categories. This place is a dream for an OCD person like myself! 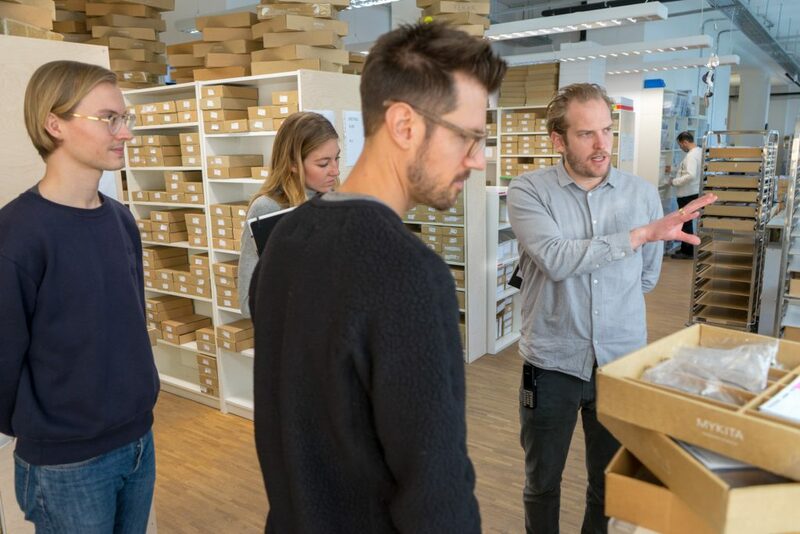 Many thanks to Maximilian for facilitating our experience, Azadeh for her Mykita history and culture presentation and Joe for his production tour. Of course, we can’t forget Ann-Sophie as she learned alongside us in preparation for her position with Mykita in Communications. The stainless steel raw material is shipped from Sweden and then an intense 80-step production process begins at the Mykita Haus. The acetate is shipped in from Italy and the Mylon colouring process is completed in Southern Germany. We were in awe as we were led through each stage, watching the employees hand-bend, shape and polish the Mykita bridges, temples, fronts and hinges. 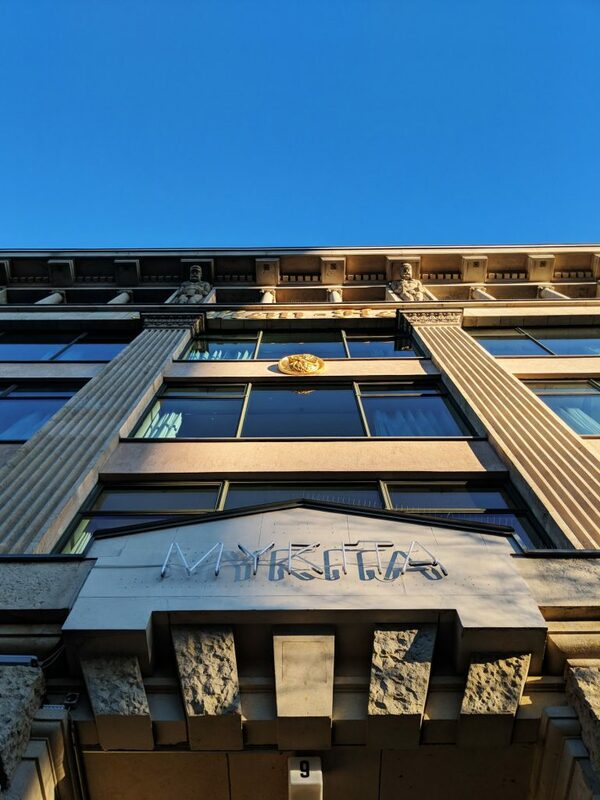 Berlin is home to 2 Flagship Mykita Shops, the original in the Mitte district of East Berlin and the second in the Bikini district of West Berlin. These shops have a very different vibe, yet both of them embody the sophistication and effortless fashion of Mykita culture. The shop in Mitte is smaller and more traditional whereas the shop in Bikini, located in a high-end shopping mall, is edgier and more spacious. I have been told that Elton John breezed through the Mitte Shop and left with 15 pairs. With Mykita’s many different collections (and some money to burn) this would be easy to do! As we walked around Berlin and hopped on and off the metro, we noticed that quite a few people were wearing minimal metal frames. Chunky plastics were far and few between here; when we happened to see bold frames, they were artistic and proportional, not like some of the ill-fitting oversized plastics I have seen in our area. Naturally, we saw many Mykita frames as this region is their birthplace. As for shapes, circles are beginning to settle into ovals and deep rectangles are narrowing down again. 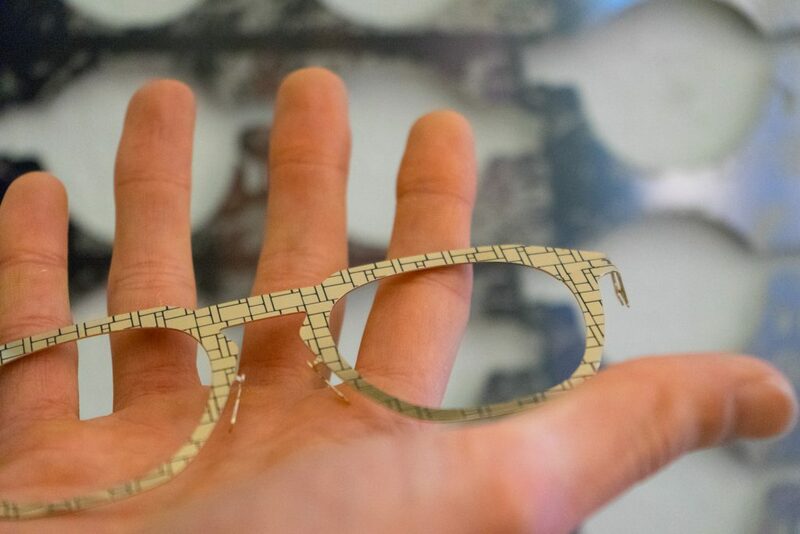 One of the Mykita designers showed us some secret prototypes. I can’t disclose too much, but trust me, they are very cool! Cycling and coffee. Berlin Bicycle Cafe, you would love it here!